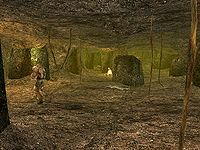 The Corprusarium is a series of caverns beneath Tel Fyr. Here Divayth Fyr collects victims of corprus disease and performs experiments in the hope of finding a cure. Most victims of corprus disease are sent to the Corprusarium by the Tribunal Temple. The caverns are guarded by Warden Vistha-Kai, but you are free to explore the whole area. However, you must not attack or kill the inhabitants, i.e. the diseased, if you don't want to anger Divayth Fyr. Also in the Corprusarium lives the last known Dwemer, Yagrum Bagarn. The inhabitants of the Outer Corpusarium will attack you on sight, while in the Corpusarium Bowels the inhabitants won't attack unless you attack first, as the former have a fight rating of 90 and the latter only 50. The Corprusarium contains a number of locked (lvl. 100) and trapped chests. Each of them contains some loot and a key which opens another one of the chests. The first key in the sequence, the 637th, can be found on the desk just behind Divayth Fyr in the Hall of Fyr. This opens the chest just off the western path in the outer Corprusarium. Inside that chest is the 678th key, which opens the chest hidden in the pool beneath the eastern path. That chest in turn contains the 738th key, which opens the chest sitting in the water in the side room on the eastern path, behind the wooden gate. In that chest you will find the 802nd key, which opens the chest by the fire at the very end of the western path. That chest contains the 897th key, which opens a chest back up on the bottom floor of Onyx Hall. Inside that chest is the 1008th key, which opens a chest back down in the Corprusarium Bowels, in the corner of the room straight ahead from the eastern entrance (the one with the skeletal corpse on the ground). This key also opens the locked Golden Door in the lower level of Onyx Hall. There you'll find the 1092nd key, which opens the Small Ornate Lockbox all the way back up in Divayth Fyr's room in the Hall of Fyr. The lockbox contains the 1155th key, which opens the final chest in the Corprusarium Bowels, near Yagrum Bagarn and Uupse Fyr. Most of the chests contain minor miscellaneous Dwemer items. The real treasure is found at the end of the sequence. The Lockbox in Divayth Fyr's room contains the Daedric Sanctuary Amulet, which allows you to obtain the unique Daedric Crescent, and the final chest in the Corprusarium Bowels contains the artifact Volendrung. If you are having trouble dealing with the corprus monsters, who will chase you around and attack you as you go between the chests in the outer Corprusarium, find the Guarskin Drum on the eastern path and bring it to Uupse Fyr. This will calm the monsters and render them non-hostile. In the Second Era, these caverns were known to be part of the Abanabi Cave system. This page was last modified on 14 October 2018, at 07:32.